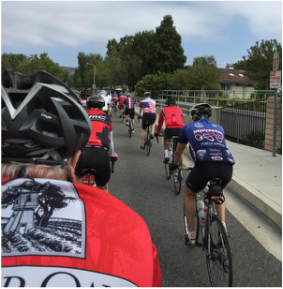 Conejo Valley Cyclists is known as “the friendly club.” We also want to be known as “the safest club.” Help us meet that goal by reviewing and following the Ride Etiquette pledge, the California Vehicle Code Statutes and some additional safety tips. Wear a helmet and ensure my bike is in good working order. Ride to the right, pass on the left. Ride in the bike lane (where available) and signal when moving into another lane. Call out and point if I see a traffic hazard. Respect ALL traffic laws and the rights of all autos, bicycles, and pedestrians. Ride predictably and remind other to be safe. Come to a complete stop at all stop signs and red lights. Riders under 18 must wear a helmet at all times. Only one ear bud or headphone may be used while cycling. Ear buds and headphones should be not be worn. Uses of a mirror, if comfortable. Slower riders should stay to the right of the bike lane or road, especially when ascending or descending. Do not overlap wheels with the rider in front of you. Ride defensively at all times.